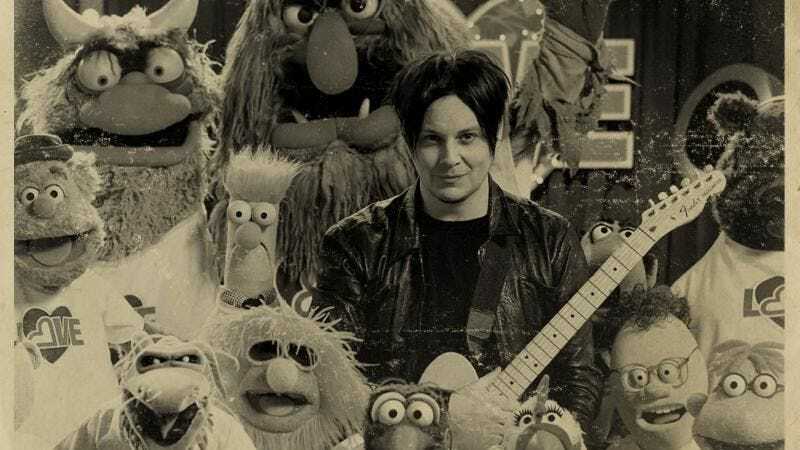 Last night on The Muppets, fans of anthropomorphic felt and Jack White almost had a coronary, for those two forces joined up to perform “You Are The Sunshine Of My Life,” a.k.a. Kermit and Piggy’s song. And now, you can get your very own copy of this musical supergroup, as White’s label, Third Man Records, is now offering a 7-inch of this performance. Finally, when your brother brings by his children to see you on holidays, you have an alternative for the stereo besides his damn copy of Kidz Bop Volume 31. Side A is a performance of the track featuring White on vocals, backed up by the immortal Muppet house band, The Electric Mayhem. But fear not, because if you want the TV version, which includes the Muppets singing along with White and the Mayhem, that’s your B-side, ensuring the perfect fusion of childhood nostalgia and pale Detroit blues-rock obsessiveness. Of course, it’s a Stevie Wonder song, meaning you’ll have to settle for an extra element of musical genius in the mix, but it’s not a perfect world. You can pre-order now, but it won’t officially go on sale until the end of April. Until then, you’ll have to settle for watching Kermit and Jack do their version of one of those James Corden-style car sing-alongs to The White Stripes.